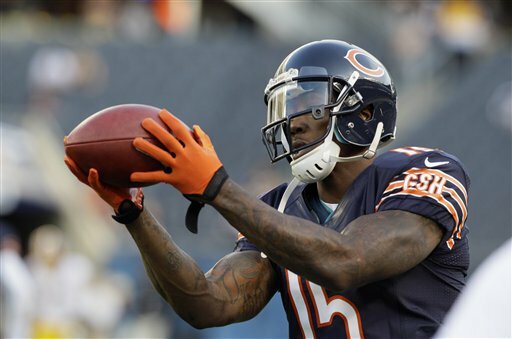 Expect to see more of wide receiver Brandon Marshall Friday in New York. Rookie safety Brandon Hardin being taken off the field last week. 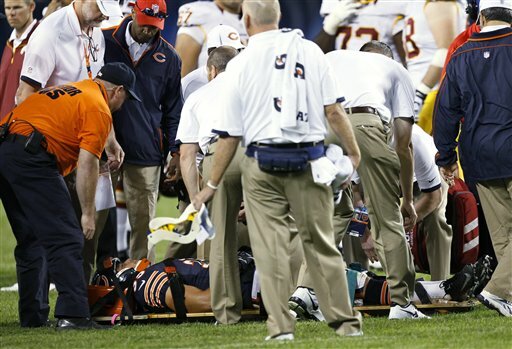 The Bears need to get through Friday’s game without injury. It may sound like a contradiction, but Friday night&apos;s pre-season game for the Bears in New York does have some value and a little bit of importance. Up until now, most of these late summer games have been about the players just getting into shape, looking for continuity and trying to stay healthy in the process. Game 3 in the exhibition schedule is actually called the "dress rehearsal" for the regular season. Why? This is the one contest in which you&apos;ll see the starters on offense and defense for an extended period on the field. What is on tap for the starters? The biggest key to this game: finish without any injuries. The most enduring question mark throughout the pre-season, heck for the past few years, has been the state of the Bears&apos; offensive line. Not that the Superbowl-defending champ Giants will be showing everything; but one of reasons they&apos;ll be wearing another ring is due to the pressure they bring from their defensive front. "I don&apos;t think anyone else in the league has five to six guys like that to rotate," said Bears QB Jay Cutler. "It&apos;s going to be a tough test for the [offensive line]." Just two years ago in a regular season game, Cutler was like a rag doll, the way New York sacked him nine times, almost at will. The offensive line will have a rotation of left tackle J’Marcus Webb and left guard Chris Spencer in plays on the line, and left tackle Chris Williams and left guard Chilo Rachal will also have an opportunity to play. It almost seems like a wrestling match for the best tag team. It has been a recurring theme each week but there is no doubt it is the most important decision offensive coordinator Mike Tice will make before the season opener. Last week Bears fans got to see the many weapons in the Bears offensive arsenal. However, wide receiver Brandon Marshall thinks he is miles from where he wants to be when the season begins. "It&apos;s a little humbling to have to be more disciplined with my routes," he said. Despite what Marshall thinks, Bears fans are giddy thinking of the possibilities for this season. If there is one thing the Bears defense should worry about it&apos;s health at this point. Three starters are down, and of course, Brian Urlacher is one of them. This past week has been a merry-go-round to figure out what went on with his prior treatment. Second year defensive tackle Stephen Paea will miss his second game and last week safety Chris Conte injured his shoulder. Back-up rookie safety Brandon Hardin was carted off the field last week and is out with a neck injury. Safeties Craig Steltz and Major Wright will anchor the secondary; they need to stay healthy or the Bears could be in big trouble. The Bears defense will have a great test, just like the offense. Giants quarterback Eli Manning will work the Bears secondary. The Bears defensive line will try to apply their pass rush to a very sturdy New York offensive line. Special teams have a big concern, too: Starting punter Adam Podlesh is out with a hip flexor injury, so rookie Ryan Quigley from Boston College will get his chance to kick the punts. Of course, the Bears would love for their offense to perform well enough for punting to be limited. The 3rd and 4th string players have a different view of this game; it&apos;s the last time that some of them will be wearing a Bears uniform — maybe any professional uniform. Thursday the Bears cut veteran running back Kahlil Bell after he declined a pay reduction from his $1.2 million salary. On Monday, all the teams in the NFL will reduce their rosters to 75 players, so this will be the final pro game for some players. As Bears offensive lineman Chris Williams said, "Players need to perform for their resume. If they don&apos;t make the team, maybe someone else will want them." The harsh reality is that players usually in the first wave of cuts rarely play again, unless there is an injury. None are household names; most you don’t know when you pass them by at training camp. If they do get in the game Friday it will be late and the minutes will be few; but at least they can say they played in the NFL for the Chicago Bears.